At 9 years old, Laynee Wilson graduated from Barbizon USA of Columbus, GA. Since her Barbizon graduation, Laynee has competed at the Atlanta Barbizon Competition, won a scholarship for acting school, and signed with BMG Models. We sat down with this rising model to learn about her time with Barbizon and how it has brought her so much industry experience. First things first, can you tell us what your Barbizon classes were like? I graduated from Barbizon of Columbus, GA when I was 9 years old. I learned how to do my favorite runway pose, the “H” pose! I learned how to express myself through fashion: if I wear blue, that means I am sad or trying something new, pink means I’m super happy, yellow means I’m trying my hardest. I also loved learning the five minute face and about moisturizing my face and skincare basics. What did you gain from your Barbizon experience? I was shy before the classes and nervous about making new friends. I learned to be confident and how to make new friends of all ages. Two classmates became really good friends, their ages are 20 and 10 1/2. I found that friends don’t have to be my age. A funny thing I got from the classes is learning to change my eating habits. Before the classes I was a child who loved eating very healthy and would chose a salad over popular kids food every chance I got. People thought I was crazy. When I learned about nutrition in the classes, I felt more happy about my eating habits. I was already eating like a model and I LOVE IT! What has been your favorite thing about Barbizon? All the teachers and all the friends I have. Miss Haley was the best teacher I have ever had. I learned about all the possible poses I can choose from and a serious face. Congratulations on winning 2nd Winner Up at the 2017 Atlanta BCOMP! 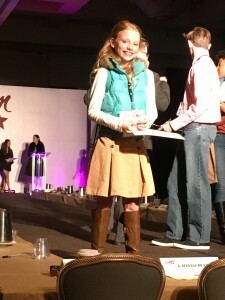 How was your Barbizon Competition experience? Thank you! Being in the 2017 competition in Atlanta was “spectaculous”. I was freaked out at first but I could see my mom and everyone watching me being me, then it became super fun! My mom says the number one rule in modeling is to have fun! I also won a professional photo shoot. That was so awesome! I got so many callbacks that it felt unreal. It gave me experience and showed me I had potential. I was a real model. I knew I would be signing with an agency soon. A few weeks ago Mercedes with Barbizon, invited me to go on some interviews in Atlanta with her and six other girls. I just signed a two year contract with BMG! BMG finds paying work in print and runway modeling and film acting. I did my win photo shoot in May and my pictures were unique and matched my personality. I loved the photo shoot, it was amazing and I felt fearless! I just got a one year scholarship for a film acting school in our new city, Huntsville, AL. We moved to Huntsville right after the Atlanta competition for more opportunities for my whole family. My new school has a fun acting club that I love being in. I will be in the club again this next year. Here in Huntsville I auditioned for the 30th Annual Barbizon Competition in Florida. I won a spot and I am already registered. Miss Jamie already knew who I was and it made me feel impressed and a little famous! You’re competing again this year at the 30th Annual Barbizon Competition in December, what are you most excited about for this year’s competition? I’m excited to have the chance to improve my runway skills in front of judges and a room full of people. I get to be myself again on the runway, that makes me feel free. I am also excited to see how many callbacks I get again, to show me and others I am a serious model. I am really excited to see if I can win anymore prizes this year. Is there anything you would like to say to your Barbizon staff? I want to tell Barbizon staff, YOU’RE AWESOME! You gave me the best teachers and experiences ever. Barbizon is part of our family now! Hopefully we can get classes in Huntsville! Thank you for seeing me in the Columbus, GA mall and seeing the model in me, even though I was only 8 years old. They did not know, me and my parents had just talked about me being a model one day so I could reach my life dream. I want to be a WWE female wrestler. Most start out as a model or actress, so they can walk their entrance to the ring (like Nikki Bella). We didn’t really know how to get this dream started. Barbizon saw me and called me to the table at the mall. I have been living my dream because of you! I want to thank everyone at Barbizon for helping my mom figure out how to help me reach my dreams! I want to say thank you also. I don’t know anything about this industry, but you have helped us not only figure out what steps to take to help Laynee, but also understand what we should be doing and looking for to progress!